This information is designed to help existing dealers who have just switched to using Frazer and want to use it for Accounting. NOTE : If you’re a brand new dealership, you're in the wrong place. Click here to get Accounting Setup help for New Dealers. You may have opened your dealership quite a while ago, but are just switching to the Frazer DMS. The steps below are specifically tailored for you. You're going to select a start date. This will most likely be the beginning of the current year. You likely have existing customers you're taking payments on. It's possible to continue tracking those in Frazer using the Pre-Existing Customer program. This lets you add vehicles, sell them, and then account for any payments they've already made quickly and easily. Watch the video tutorial below for more info on how to add Pre-Existing Customers. Afterwards, Follow the steps below to continue with your accounting setup. Decide the date you want to begin accounting for. - This is the date you'll go back to in your records. You'll want to enter any info from your start date forward, that's not already in Frazer. If anything's missing you'll add it using the steps below to guide you. Typically this is January 1st of the current year. If you're switching from another DMS or your CPA is requesting it, a Mid-Year Start Date may be possible. Just call us at 888-963-5369 for more info. You will need to select G/L Accounts to pay for different things in Frazer. To start, you need to focus on three specific areas : Vehicle Purchases, Added Costs/Reconditioning, and Floor Planning. We've made this as easy as possible for you, too! 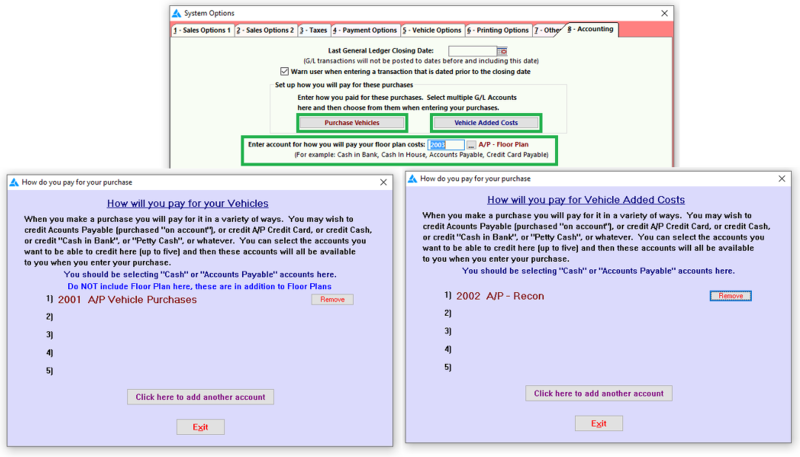 You should use GL Account 2001 to pay for your vehicles. You should use GL Account 2002 for added costs/reconditioning. You should use GL Account 2003 for floor planning. You can go ahead and select these “pay” accounts by clicking Miscellaneous → 1. System Options → Tab 8 : Accounting. Important : The next step is only useful if you have existing data in the Frazer software. If you do not have vehicles or customers in Frazer yet, you can skip this step and continue to step 4. You’ll need to print 3 total reports and verify the data on them. These reports will help you get your relevant vehicle data as accurate as possible. This is your homework. You will need to set aside time to handle this. Maybe even delegate it to someone and make it their only purpose until it’s complete. A. 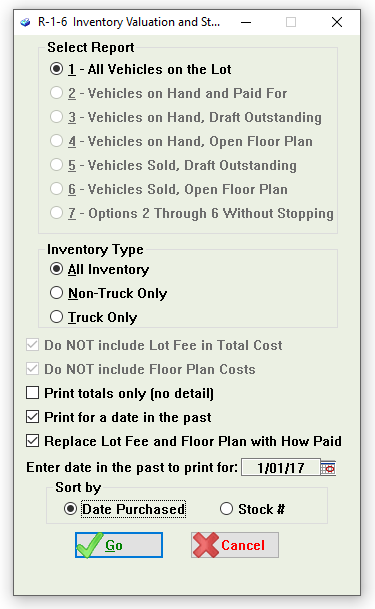 Print an Inventory Valuation and Status for a date in the past. Run it from the Accounting Start Date (from Step 1). Make sure you check the box to replace Lot Fee and Floor Plan with How Paid. vehicle costs, how those costs were paid and their added costs totals are completely correct. 1. Is the purchase date on each vehicle correct? 2. Is the price correct? 3. Did I add all of the reconditioning I did to each vehicle? 4. Did I choose the right G/L account? Remember - for vehicle purchase, you should use G/L Account 2001. Video : Adding and Paying for Vehicles - Watch this tutorial for more info on adding vehicles and paying for them in Frazer. B. 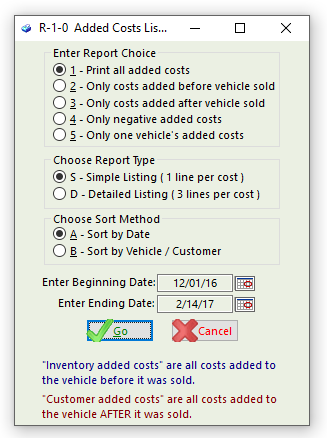 Print an Added Costs Listing. Run it from one month prior to your Accounting Start Date to the Current Date for your date range. each added cost’s specific date, vendor, amount and account used to pay for it. All of this needs to be verified, and corrected if needed. 1. Are my dates correct on each added cost? 2. Did I use the right G/L account on each one? Remember - you should use G/L Account 2002 for Added Costs/Reconditioning. 3. Is the amount correct? 4. Is the vendor correct? Video : Reconditioning and Added Costs - Watch this tutorial for more info on adding reconditioning/added costs in Frazer. 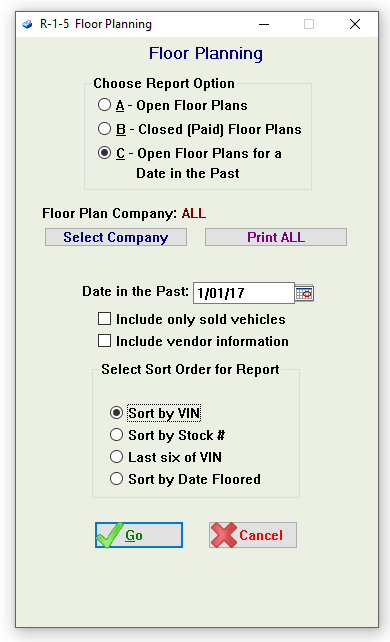 C. Print a Floor Planning Report. This Report will allow you to quickly verify which floor plans are open and the amount of principal on each one. You can double check this against your records to make sure everything’s up to date. 1. Did I actually close any of these floor plans in real life? 2. Is the current principal balance correct? 3. Are my dates correct? 4. Did I use the right G/L Account? Remember - you should use G/L Account 2003 for Floor Plan payments. Tutorial : Floor Planning - Watch this tutorial for more info on how to add and track your Floor Plans in Frazer. Important : If you completed step 3, you can skip this step and move on to step 5. To add a vehicle, click Inventory at the top left of Frazer. Then click Add Vehicle on your Inventory screen. From here, fill in the blanks. Feel free to get as detailed as you'd like. In the Vehicle Costs section, be as accurate as possible. 3. Did I add all of the reconditioning I did to this vehicle? 4. Did I choose the right G/L account for my costs? Once you complete the above work, it's time to give us a call at 888-963-5369, to continue your Accounting Setup. When you do, we will get you in touch with an Accounting Specialist to complete the process. They’ll go over any existing customers and how to do more advanced Accounting in the software. From there, they will will set your General Ledger account balances and do your first bank reconciliation! This will correctly offset any of the faulty data that may be there from before your Accounting Start Date. How Things Post - How Accounting works in the software. Entering Bank Deposits - How to log a bank deposit into Frazer. Entering Expenses - How to enter certain Expenses (non-sale related purchases and bill payments) into Frazer. Bank Reconciliations - How to perform a bank reconciliation (comparing your Frazer checkbook to your actual bank statement). Entering Pre-Existing Customers - How to add a sale you did before using Frazer. Buy Here Pay Here and Outside Finance Sales - How to Process in In-house financed deals, and outside financed deals (with outside lenders). Entering Payments - How to log payments you've taken from your customers into Frazer.